ADAMTS-13 (a disintegrin and metalloprotease with thrombospondin type 1 motif 13) is an enzyme (vWF-cleaving protease or vWF-CP) that specifically cleaves unusually large von Willebrand factor (vWF) multimers, which induce platelet thrombus formation under high shear stress conditions. 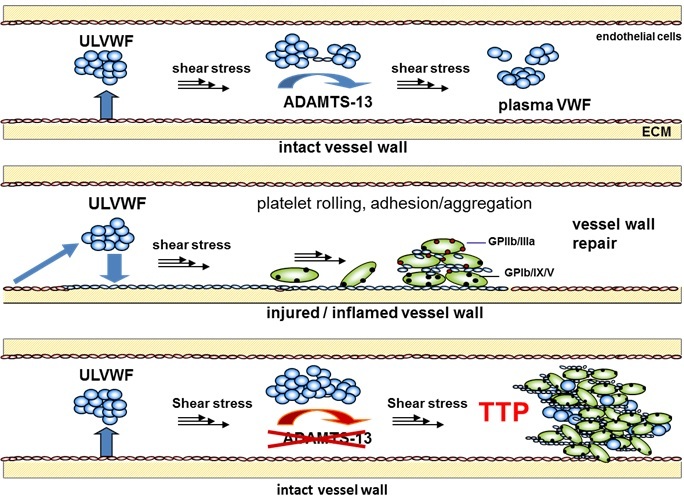 If the activity of ADAMTS13 is lowered for some reason, unusually large vWF multimers may accumulate within blood causing thrombosis due to platelet aggregation, which in turn may lead to TTP (thrombotic thrombocytopenic purpura). Thrombotic microangiopathy, abbreviated as TMA, is a pathologic state which results in thrombosis in capillaries and arterioles, due to an endothelial injury. It may be seen in association with thrombocytopenia, anemia, purpura and renal failure. The classic TMAs are aquired hemolytic uremic syndrome (aHUS) and thrombotic thrombocytopenic purpura (TTP).